Wolfgang Amadeus Mozart was born on January 27, 1756 in Salzburg. His musical genius was discovered early on. Child prodigy Mozart began writing and performing beautiful and daedal music when he was but a little boy. At the age of six Amadeus played in front of Europe`s high nobility and was celebrated as the Wunderkind of Salzburg. 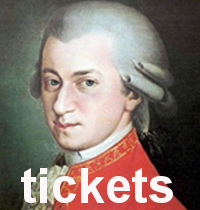 From 1771 to 1781 Mozart lived in Salzburg and worked as concertmaster for the archbishop. As his relationship with his employer grew increasingly difficult Wolfgang decided to move to Vienna in 1781. Upon arrival Amadeus` first accommodation was located in the convent of the Deutscher Ritterorden in the heart of Vienna. The convent`s premises included the magnificent Sala Terrena where he played several concerts at.